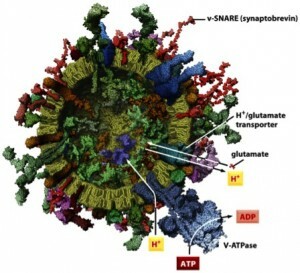 The ‘SNARE hypothesis’ states that neurotransmitter-loaded secretory vesicles fuse and release their contents in milliseconds with presynaptic membranes by zippering v-SNAREs on vesicle membranes and t-SNAREs on target membranes into a 4-helix coiled coil structure. 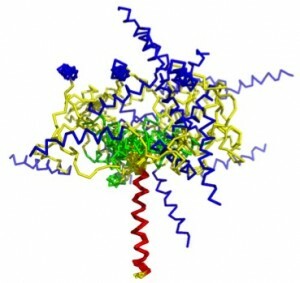 How the force of this highly exothermic reaction is transmitted into deforming membranes and how the fusion triggers calcium and synaptotagmin regulate this process is unclear and a major focus of our research. In a large collaborative effort (NIH program project) with the groups of Reinhard Jahn at the Max-Planck Institute in Göttingen, Germany, David Cafiso in the Chemistry Department at UVA, and David Castle in the Department of Cell Biology at UVA, we are taking a multi-pronged cell-biological, biochemical, and biophysical approach to this problem. 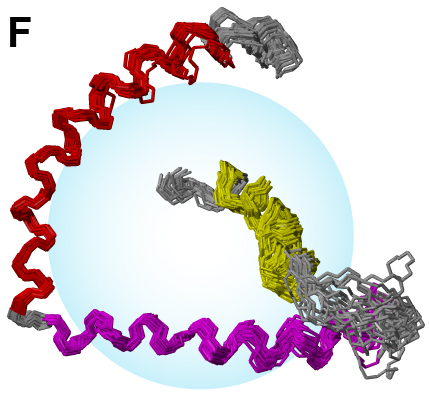 We are studying the structures of the relevant fusion proteins by combined NMR and EPR approaches in membranes. High-resolution structural information of individual components and domains is then integrated into the understanding of this multi-component molecular machine by single molecule fluorescence studies. By reconstitution of the relevant components in supported bilayers, single fusion events can be observed at millisecond time resolution and analyzed in terms of various functional models. FRET experiments permit us to determine changing spatial relationships of protein and lipid components in this process. Similar studies with native plasma membranes of secretory cells and synaptic vesicles allow us to link the reconstitution approach with the cell physiology of this process. 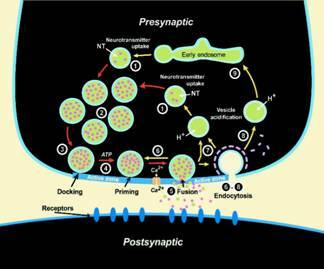 Vesicle cycling at a synapse. Structures of proteins involved in intracellular vesicle fusion. NMR structures of synaptic fusion protein synaptobrevin. 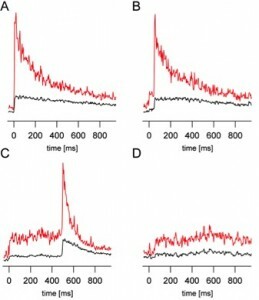 Signals from individual synaptic vesicle fusion events.